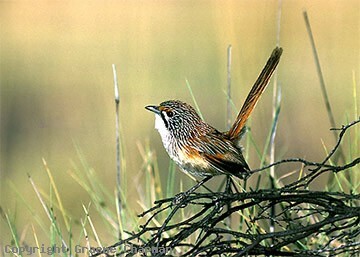 Rowley's Grasswren has recently been named in honour of Ian Rowley, a pioneer in the study of Australian malurid wrens and the study of bird behaviour here and around the world. He was one of Australia's pre-eminent ornithologists. 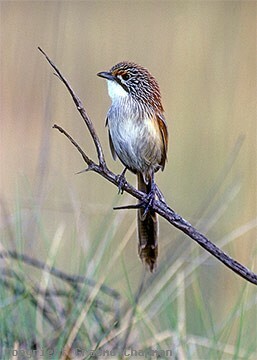 Until recently Rowley's Grasswren was regarded as a subspecies of the widespread Striated Grasswren but recent DNA based work suggests that it be afforded specific status. 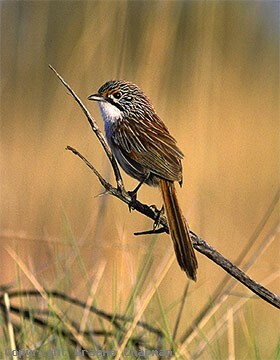 Rowley's Grasswren is found in a relatively small isolated area of north central Queensland centred around the Forsyth Range, approx 80 km south of Winton. One of the most well-known places to find them is around the small opal mining centre of Opalton - most people succeed there. However they are also known from Bladensburg National Park nearer to Winton, and from the popular tourist venue of Lark Quarry (of dinosaur footprint fame) where it is worth looking around the airport. 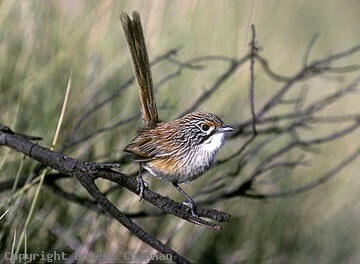 These grasswrens inhabit spinifex grassland both on flat sandplain and also in more rocky environments. The furthest south records I can find are on the Winton-Jundah road about 90 km south of Lark Quarry and further west of this in Goneaway National Park which has no public access. 872201 ... Rowley's Grasswren, female, Opalton, Queensland.